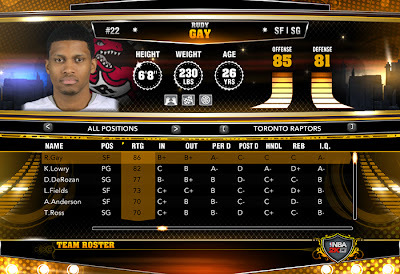 Description: A new NBA 2K13 roster update has been released, accurate as of February 2, 2013. The Memphis Grizzlies (with Tayshaun Prince, Austin Daye & Ed Davis), Detroit Pistons (with Jose Calderon) and Toronto Raptors (with Rudy Gay & Hamed Haddadi) trade has been implemented in this roster. - The blockbuster 3 team deal (Grizzlies, Pistons & Raptors) trade has been completed. - Rudy Gay & Hamed Haddadi has been added to the Toronto Raptors lineup. - José Calderón has been added to the Detroit Pistons lineup. - Tayshaun Prince, Austin Daye and Ed Davis has been added to the Memphis Grizzlies lineup. - Minor adjustments on injury status and player ratings. Extract the files using WinRAR then copy the “Online Data” and “Saves” folder in to your NBA 2K13 Roaming folder. To find your NBA 2K13 roaming folder, open “Run” and type %Appdata% then open 2K Sports > NBA 2K13 folder. Watch the video tutorial below to learn more about installing the roster and online data files on PC.